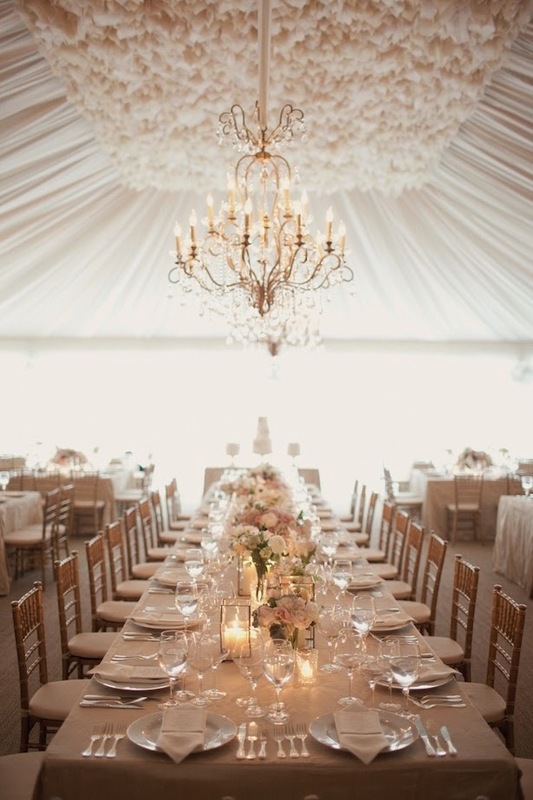 Bride, guest or just avid lover of weddings, hop on over to Wedding Party where I'm dishing on all the ways to seat guests at a wedding. InStyle had a really fascinating article in their March issue called "The Big Buy Theory." Sadly I have not been able to find the article in it's entirety online anywhere, which is why I thought I'd share what they called to be the four most common buying personalities! 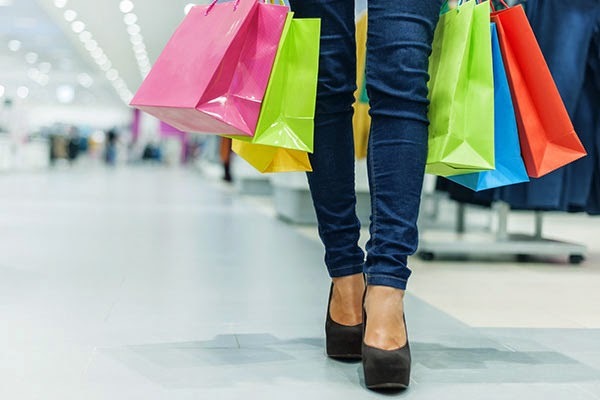 Hopefully you'll be able to nail down your shopping pattern and avoid having to ship back purchases or worse trek to the mall to make those returns. These are my interpretations of each of the style personalities! Splurge on a minimalist cut that has a beautiful silhouette that you'll end wearing for years to come. Focus on purchasing different parts of the outfit at a variety of times that way you don't get overwhelmed while adding to your closet. 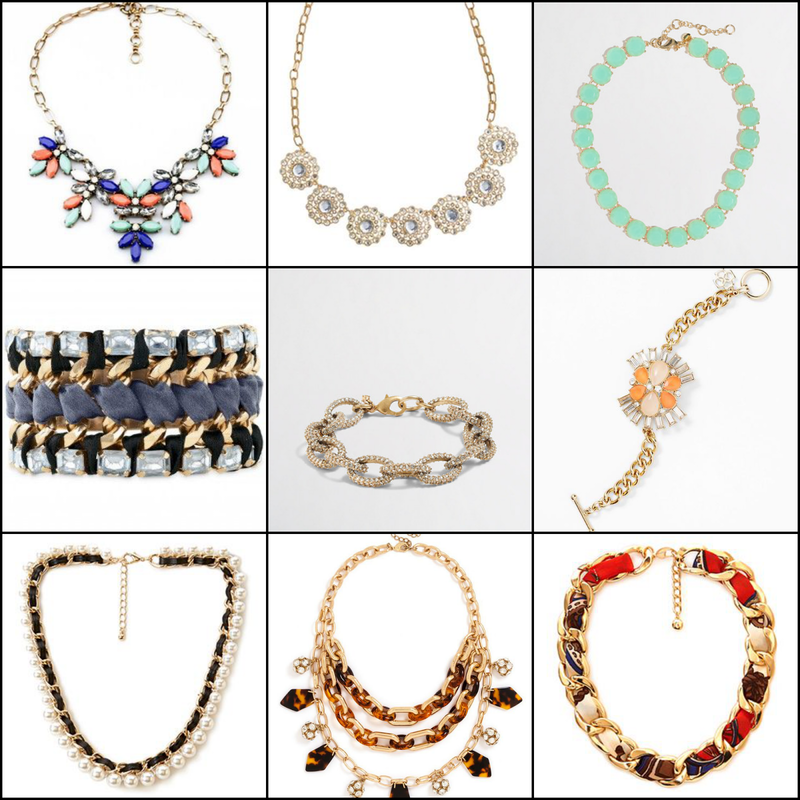 Take the time to invest in pieces that will wear well and for a long time. When that trendy piece goes on sale. Start paying attention to when you favorite brands/sites have sales and wait to make that purchase. Search the pre-owned and loved market for those expensive pieces - odds are you'll be able to find them for a fraction of the price. Personally I'm a mix of all four of these with emphasis on being a minimalist!! Definitely something I've been working on as every morning I feel like I'm staring it to a dark hole of nothingness...I think the phrase we've all uttered " I have NOTHING to wear!" I've been making a conscious effort to buy pieces that will work with items that are already in my closet!! A few weeks back I had my take on Work Wear Staples. 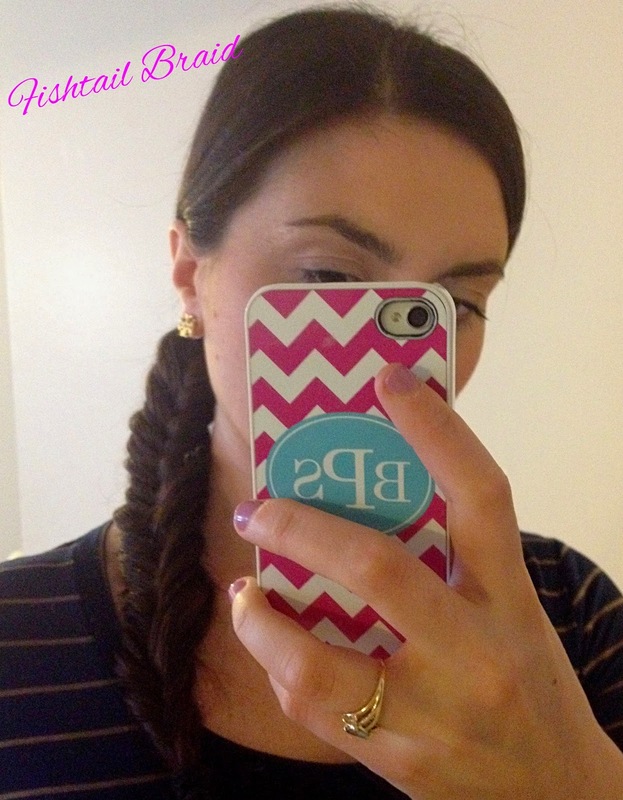 Today I'm back with the part I love just a bit more - the accessories! This is the where you add an extra touch to your work outfit to complete your look. I'm too embarrassed to show you my shoe drawer at work in an actual photo. I think it's so important to have a comfortable but classic shoes for work. 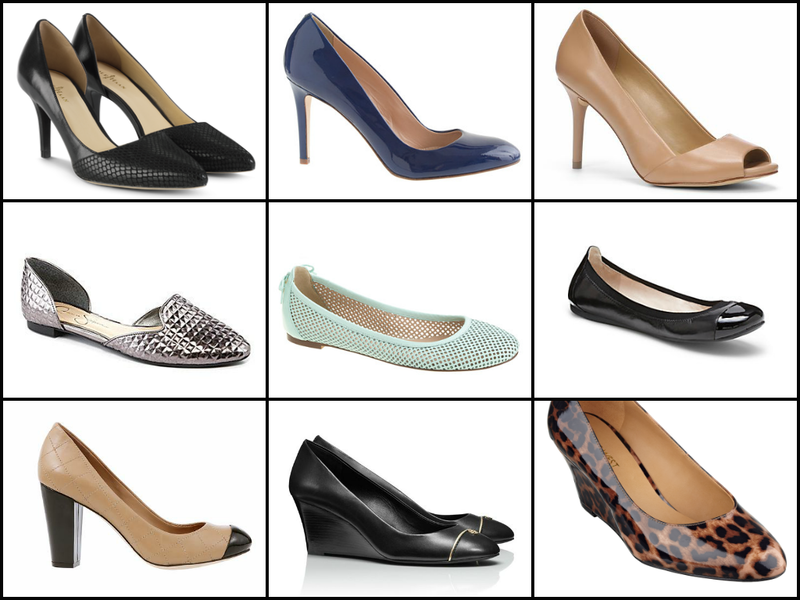 I am all about flats and actually prefer them on most days when I know I'll be running around the office. I also like to have wedges handy because their more comfortable to transition from day to night. If there was a support group for bag hoarders - I would be in attendance...errr perhaps not, I don't think I have a problem haha! 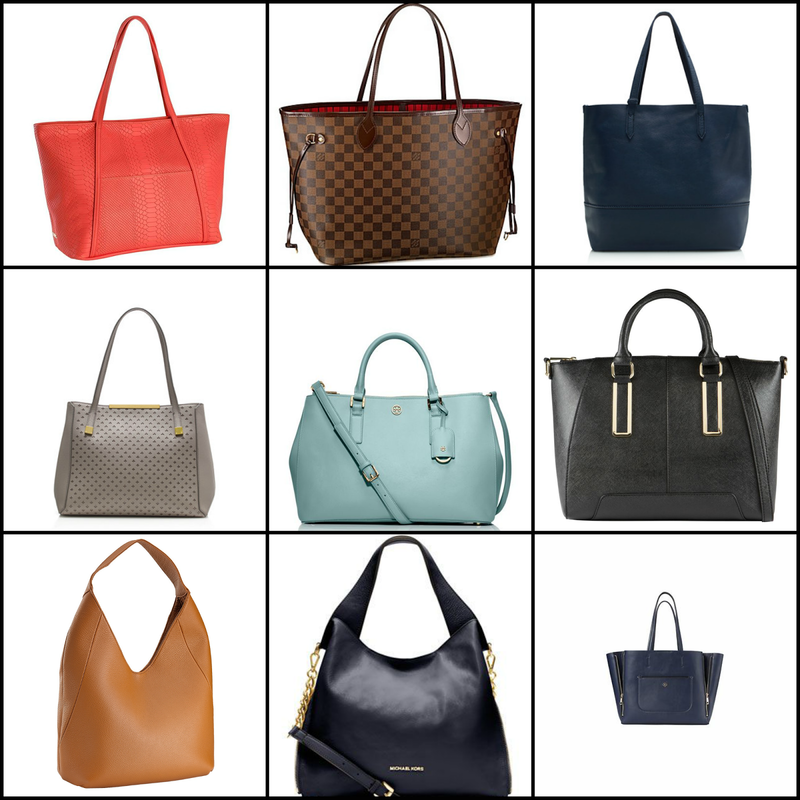 To me - the ultimate accessory is your bag!! These run the gamut from needing everything for the day, transition from day to night or serve the purpose of a weekend bag as well! I have used the Never Full Louis Vuitton bag for the last three years and I am still not tired of it - the bag lives up to it's name and I can pack it to the brim!! One of my best purchases ever! So there you have it! These are some of the things that complete my work look! What are some of your staple accessories? I'm looking forward to making this for lunch next week. Fresh & filling! I found this bad boy on our shopping trip last Sunday and it's amazing!! I'm a huge fan of spicy mayo when I eat sushi - so knowing I have this on hand to put on everything makes me so happy!!! Photos of a runner collapsing before crossing the finish line and fellow runners helping him across! This is the true spirit of the Boston Marathon! Emily from Cupcakes and Cashmere sharing her Instagram tips! 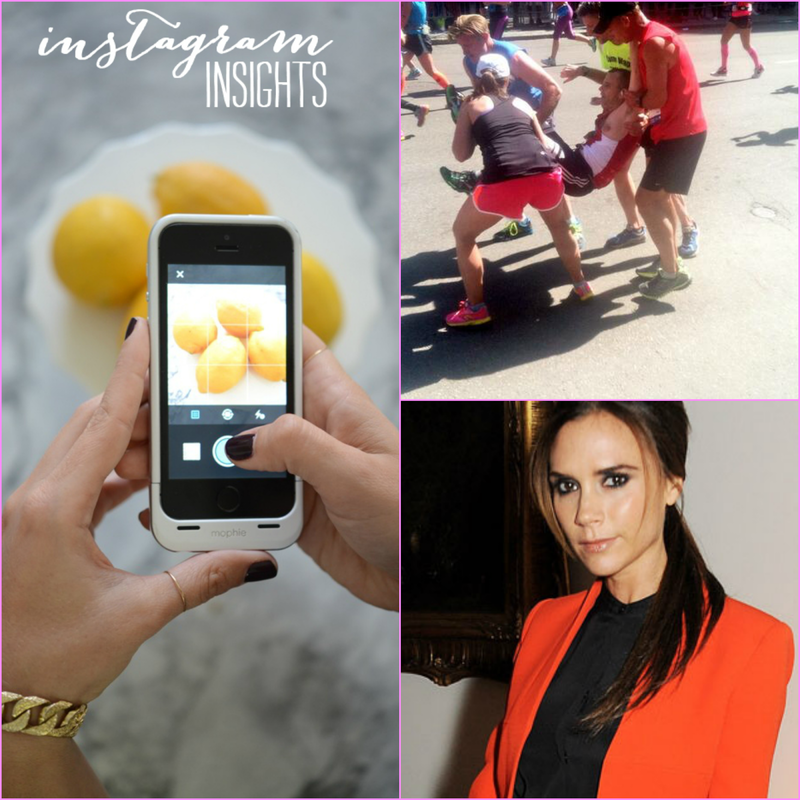 Victoria Beckham's advice on career, success & motivation. I know you are probably so tired of seeing these ladies up every single Friday - but what can I say - I love their workouts!! 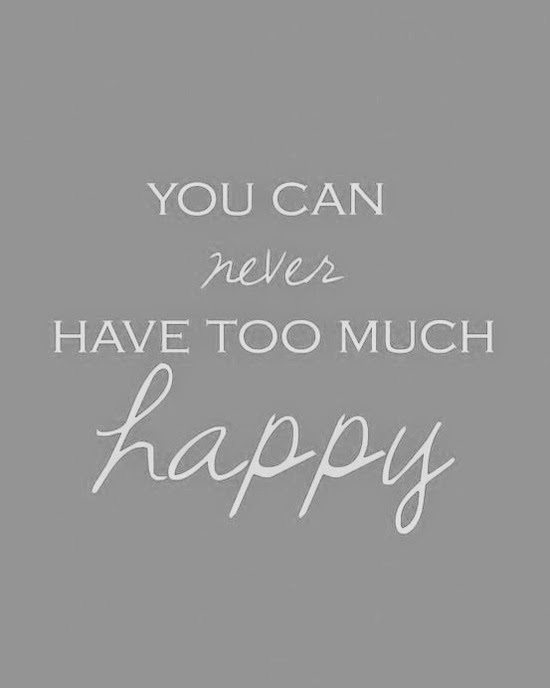 This one is especially great because you don't need any equipment!!! Perfect for a rainy day or when you're travelling! I stumbled across this song and have been listening to it on repeat!! Perfect for that last mile or at the end of your workout when you're pushing yourself to finish strong...did I just sound like a boot camp instructor?! Well this spring giveaway obviously...have you entered yet?! Also linking up with Christina, April & Natasha!! I'm really excited to share this stuffed pepper recipe. What I love about stuffed peppers, is that you can find different recipes and adapt it to suit your palette, which is exactly what I've done with this variation of Turkey Stuffed Peppers. While your meat & rice are cooking you'll want to de-seed and clean the peppers. Barley slice the bottoms of the peppers so that they stand in the baking dish. Don't throw the bottoms of the peppers out - you'll use them in the mix. Spray the bottom of the baking dish and place peppers. 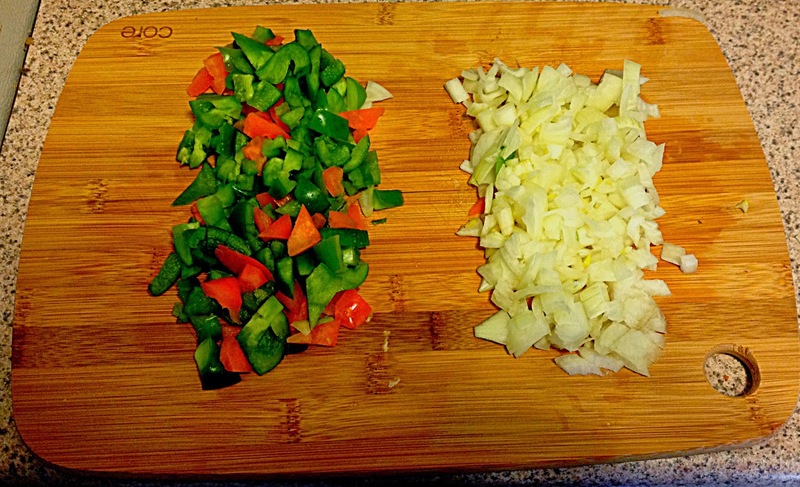 Separately chop the onion & pepper bottoms. Sauté vegetables for 3-4 minutes...soften not brown. 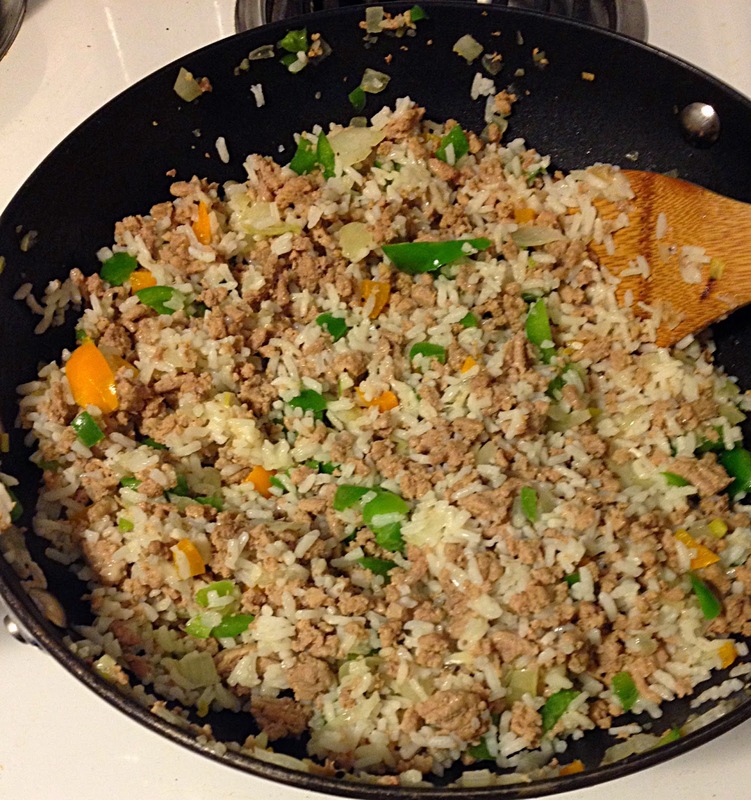 Combine rice, meat, 1/2 cup of cheese & veggies. You can season with pretty much anything. 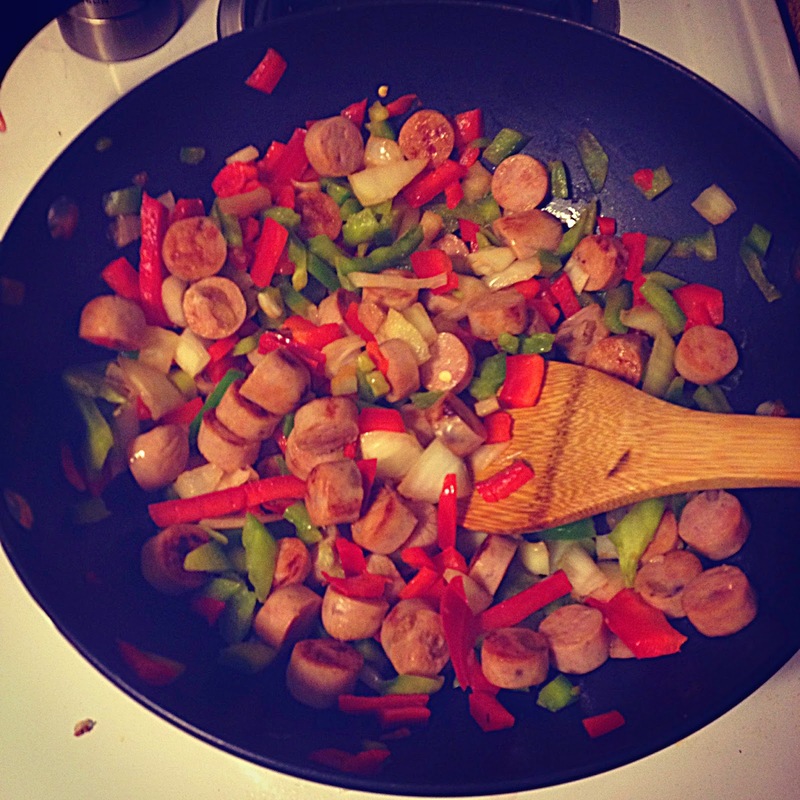 I like to add in pepper, garlic powder and italian seasoning. Mix well and remove from heat & stuff the peppers to the brim! Bake in oven 375° for 35 minutes. When that time is up add in the extra cheese to the tops and place back into the oven for another 10-12 minutes. 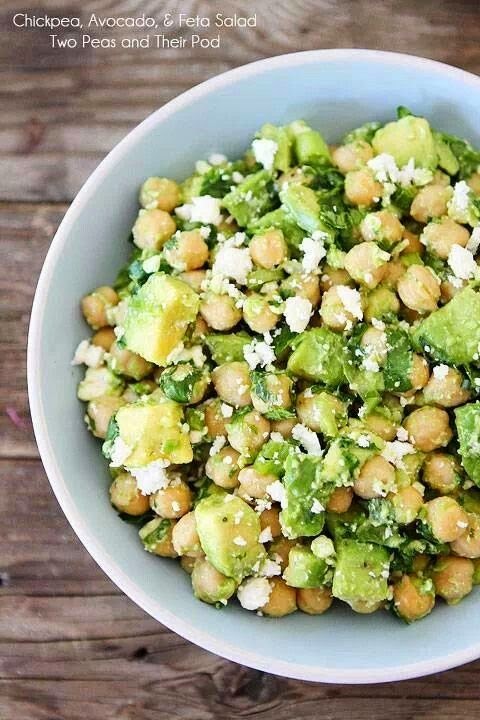 This is one of my favorite meals to make because we have leftovers for lunch!! 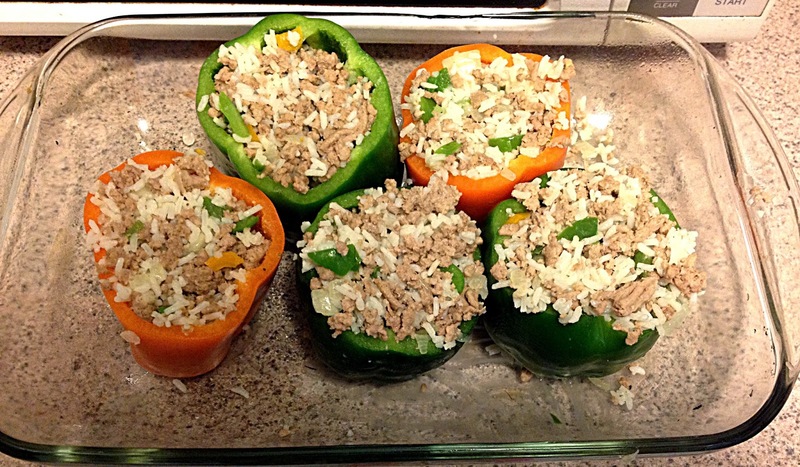 Do you make stuffed peppers...if so what do you like to put into them? Ah, Spring!! We're dusting off our flip flops and getting the SPF ready because winter is finally in the rear view (I say this with trepidation as last week our temps dropped into the freezing category). But I digress.... If I had $150 to shop towards some of my wishlist items - here's what it would look like...why $150 -more on that later!! Please don't mind my first attempt at a board...I tried, I tried! 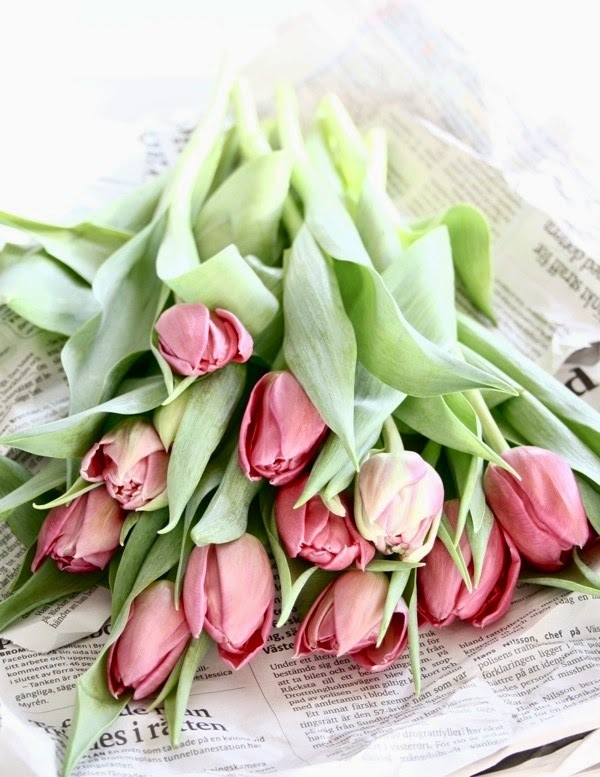 What do you have on your spring wishlist?! What you spend your $150 on? 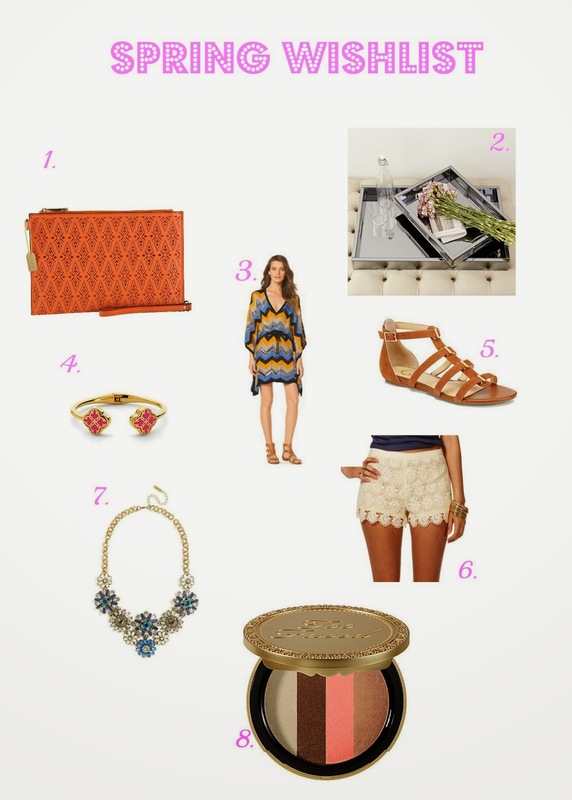 I'm part of an awesome spring giveaway with five other fantastic bloggers. Enter there and it will take you to the site! 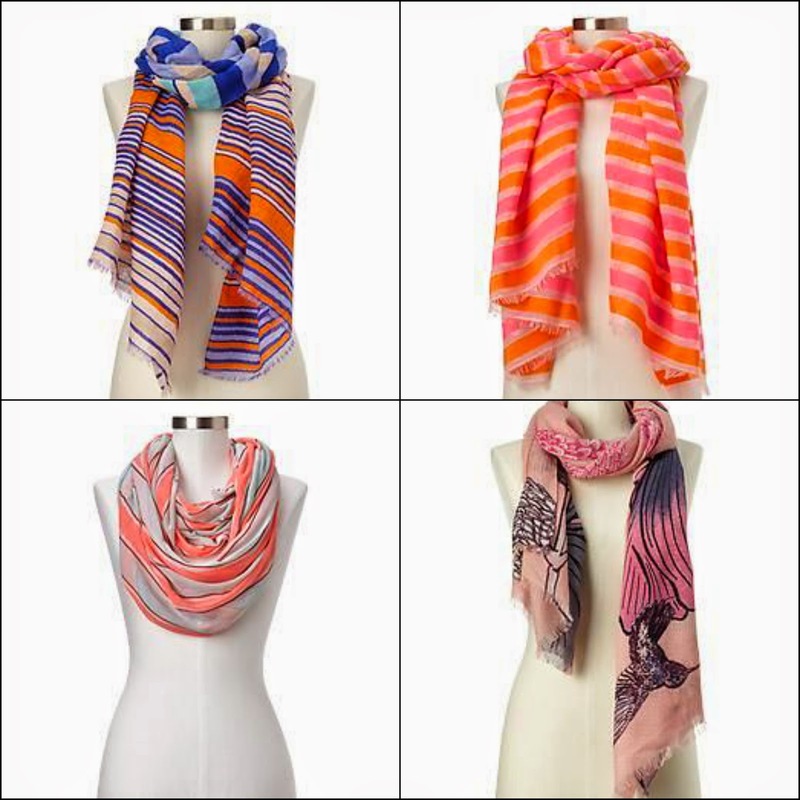 It's the crispness in the air that has me craving some new scarves in my life. 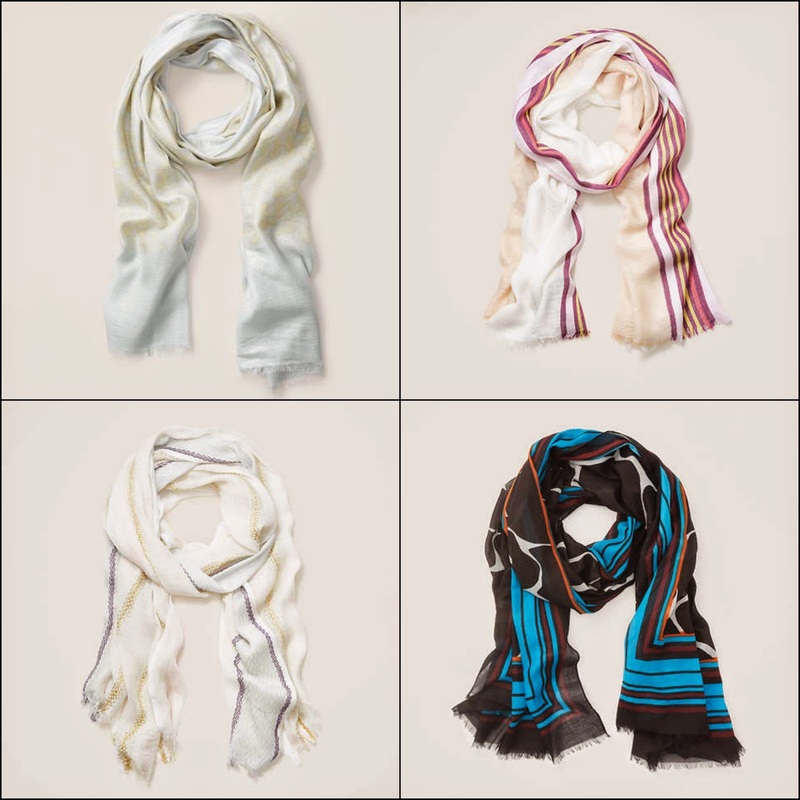 You know the temperature I'm talking about...it's about high 50's/low 60's and you don't need a full jacket but you need a little something - enter in the scarf!! Here are my favorites! I haven't quite mastered the infinity scarf yet - it appears a little too bulky on me - but that could be the material...so perhaps one of the lighter ones would work! This one and this one are on their way to my house!! 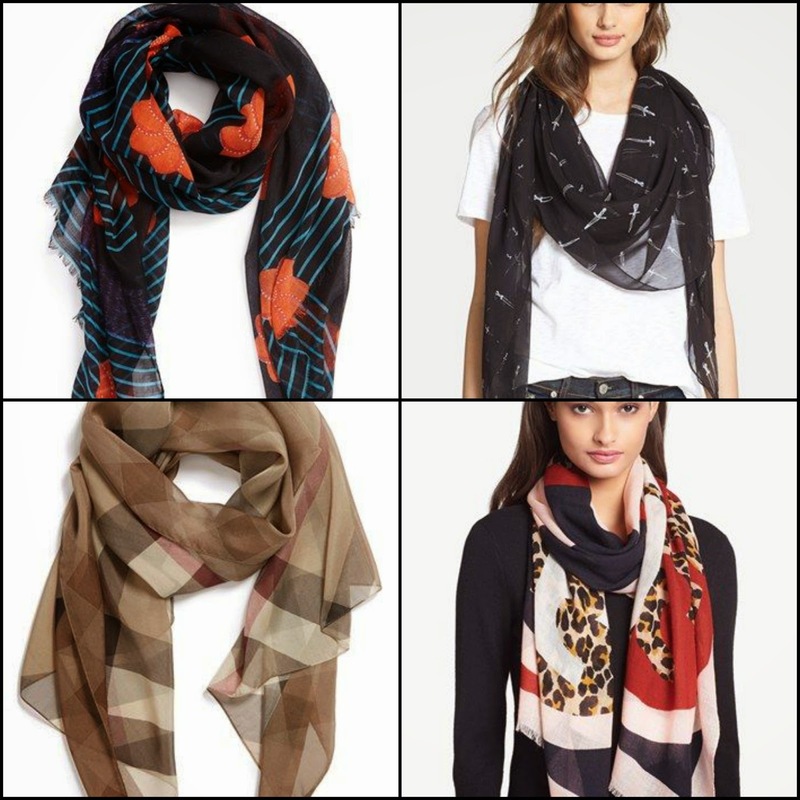 Do you have many scarves in your closet? 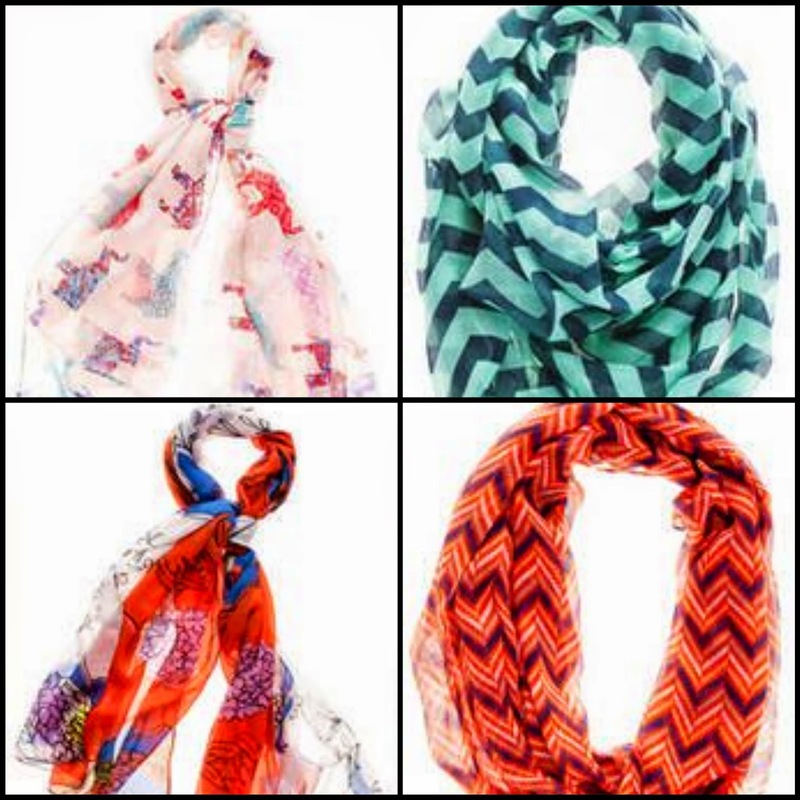 What prints do you like to wear? Also...here are the two winners from the Boston Marathon yesterday running right past our house!! For those of you living in Massachusetts happy Patriot's Day & for those every where else...Happy Monday!! I mentioned last week today is the Boston Marathon & I'm so excited to watch and see the runners cross that finish line!! We went hiking this weekend...I'm not really an outdoorsy girl - the extent of being one with nature is going for a hike - something I love to do when we go back to visit Gary's family!! I'm happy we were pretty active on Saturday because we ate our weight in ham on Sunday and destroyed this delicious tart from a bakery near our house!! On our way back to Boston on Sunday I decided to do a little Q&A with Mr. 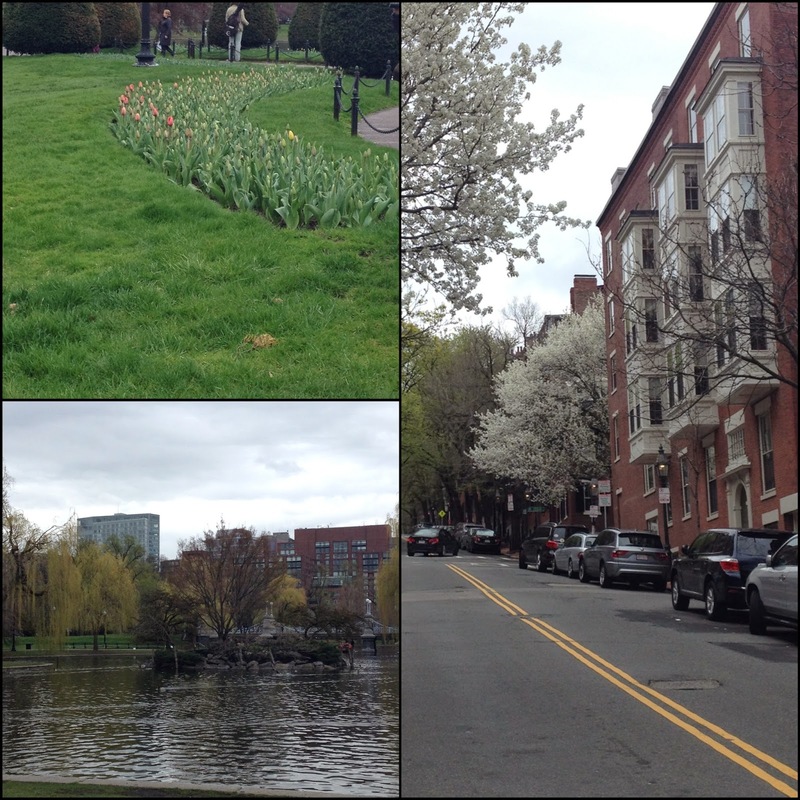 BlovedBoston!! Katie along with a few other ladies in the blogoshphere have been doing these and I love reading about the man behind the blog and what they think we write about- so without further adieu here are you go! G: Fashion & current events...no not current events, super cute stuff. Me: What's the best place for a woman to shop? G: Depends on the woman. But Marshalls or TJMaxx because she's a maxanista! G: What on earth...oh wait those are your blue rain boots! G: You Only Live Once - YOLO Bro! Is Yolo still popular? I feel bad for all those people that got YOLO tattooed on them! Me: Am I good at staying on Budget? Me: What is the Pantone color of the year? G: Oh I know this - Tiffany Blue! Me: What do women carry in their purse? Me: Anything else you want to share about me? G: You love blogging, you're just super fun and a scoop of sunshine! So there you have it - I think he did pretty well!! 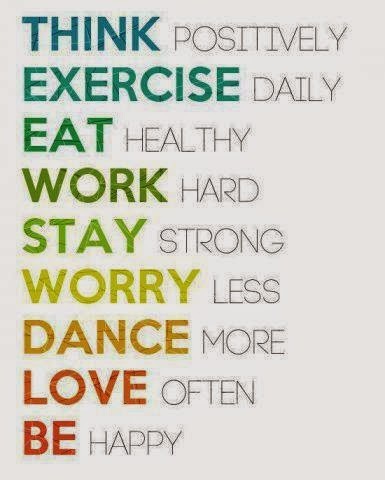 Working on all of these this week...and every day!! 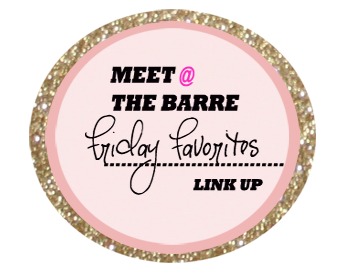 I'm so excited to be joining in on the fun with Amanda for her first Friday Favorites Link-Up!! Sharing my Favorite things from the week - I won't even take a stab at all my favorite funnies because she is always on point with those!! First off huge congratulations to Kate from A Green Fashionista for winning the Hunter Boot's giveaway...Lisa sent you some information regarding your prize!! 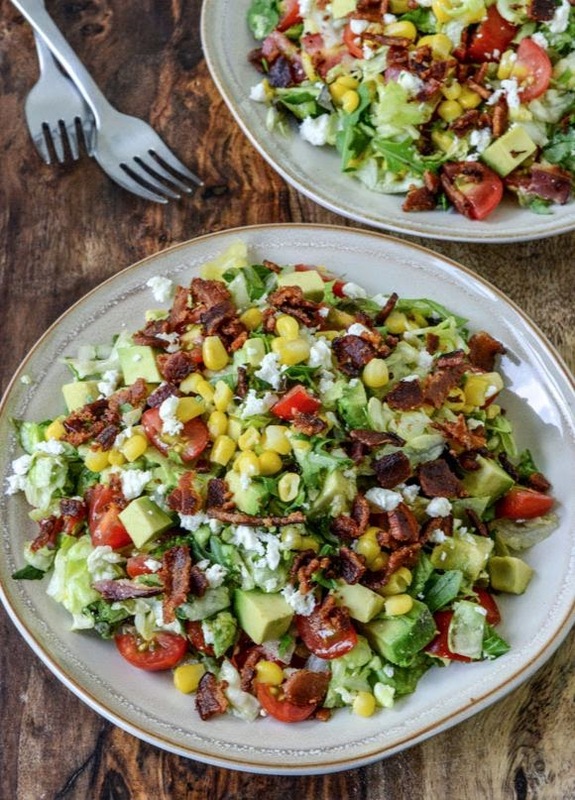 Made this BLT Chopped Salad on Wednesday night and it was delicious. I substituted regular bacon for turkey bacon and got a pre-chopped Dole salad to make preparation easier. 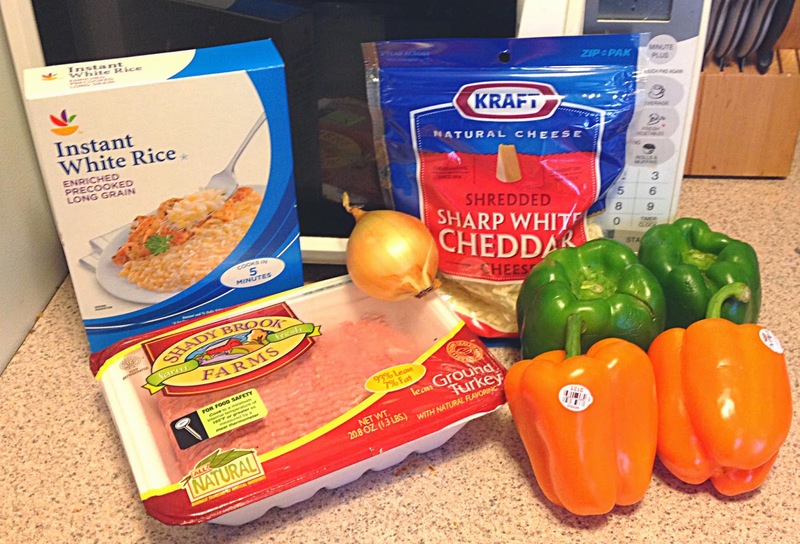 Easy and quick weeknight meal!! On Monday I went for a run in the morning, but still wanted to do a little something extra at night...didn't feel like trekking to the gym so I went in search of some new workouts from my tried and true favorite workout girls!! I had a serious sweat going after the legs & booty workout!! If you haven't checked out their YouTube Channel yet - please go...so many fun and great workouts not to mention meal planning and prep tips! This was seriously the highlight of my Tuesday!! I was walking to work and saw someone that looked so familiar and then I realized it was Maria Menounos...she is beyond gorgeous in person and so petite & tiny!! I'm pretty sure I've mentioned my girl crush on several occasions as well! I proceeded to call Gary and his response was - "that's great, but who is she?" LOL & a smiley face - we're totally besties now haha!! I'm a huge Ellie Goulding fan and although it's not a new song, Burn always puts me in a great mood! 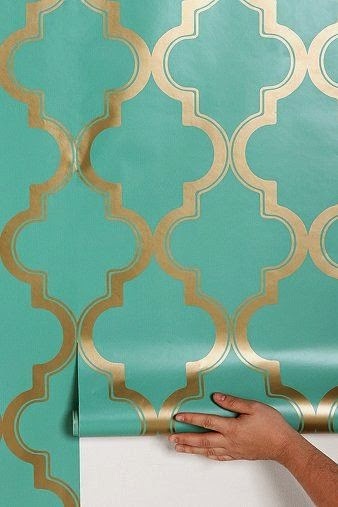 This, my dears, is removable wallpaper that was originally created by New York City set designers who needed easy to apply wall decorations and they needed to be just as easily removable. Perfect for home owners or renters to add a little life into their apartments instead of the boring white walls!! Urban Outfitters has a wide variety of colors and patterns. 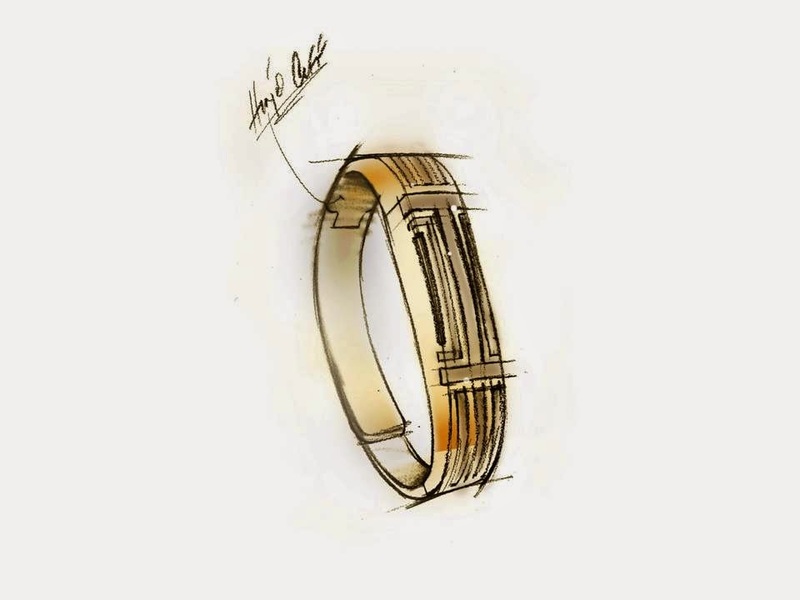 Tory Burch and Fitbit announced in February (a little late to the party on this one) that she will be creating an accessories line to make wearing your Fitbit flex more fashionable!! Genius idea!! You can sign up here to be the first to know when the line is available for purchase. Do you guys have anything fun planned for the weekend? If you're travelling this weekend - safe travels!! 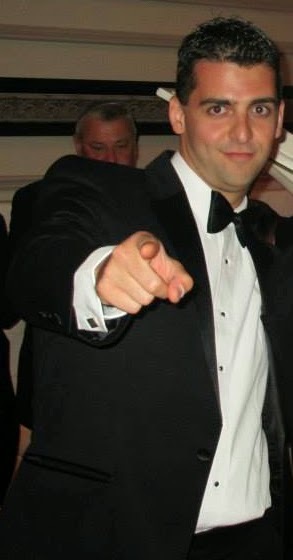 As a "young professional" I would say that half of my wardrobe is worn for work. When I graduated from college five years ago - I didn't really have any clue about "work staples" or that fine line between business casual and just plain casual. Aside from the obvious of having at least two suits - or more if you work for a Business Professional company - which I did for two years, you can pretty much make anything business casual, but where do you start?! Personally, I love wearing dresses to work because I don't have to think about coordinating an outfit. They are easy & if you find a flattering fit, can be taken from day to night! You'll find a lot of black, grey & navy dresses in my closet. As long as it's an appropriate length and not super tight I think it's acceptable to wear a variation of colors, but keep with a classic silhouette. 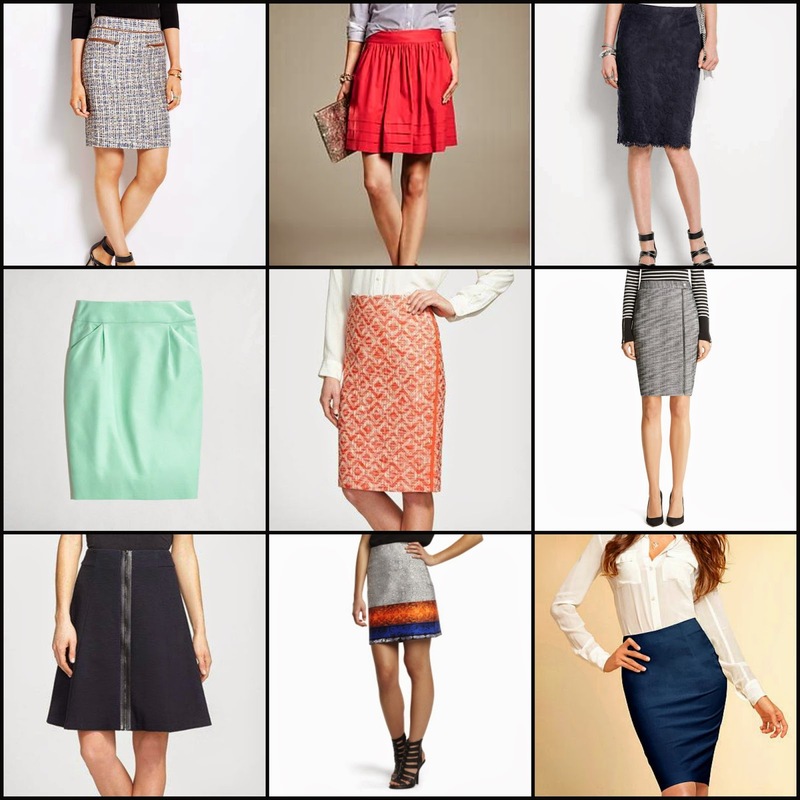 I have a lot of pencil skirts but not too much color - hopefully for spring that will change. I have become a huge fan of the ankle pant. I find it to be extremely flattering and works well with heels or flats. With that being said I have a classic pair of black and grey pants as well. 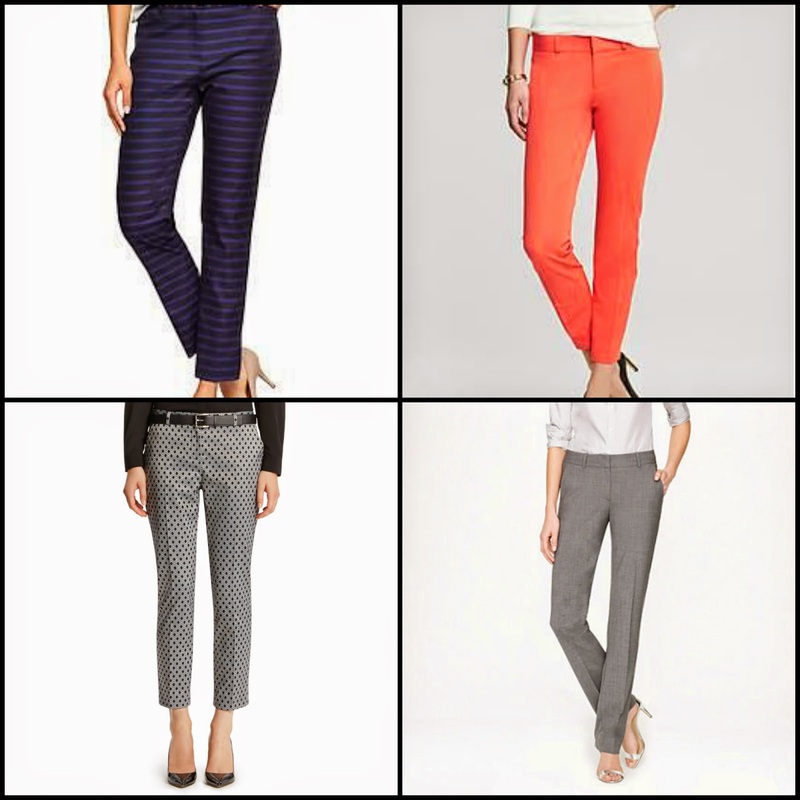 I own the Sloan pant from Banana Republic and they are easily my favorite pants to wear to work! This is pretty much a free for all and again as long as it's work appropriate (whatever that means for your firm) I say go for it! You can always throw a cardigan over anything sleeveless! If you need further inspiration for classic pieces revamped, I love checking out The Classy Cubicle - she has fantastic work wear and always looks perfectly put together! What are some staple work items you have in your closet? Where do you like to shop for work wear? Next week - Staple Accessories including shoes!! P.S. Thank you all so much for all your kind words yesterday!! It's amazing the friendships that have been built from this little corner of the internet!